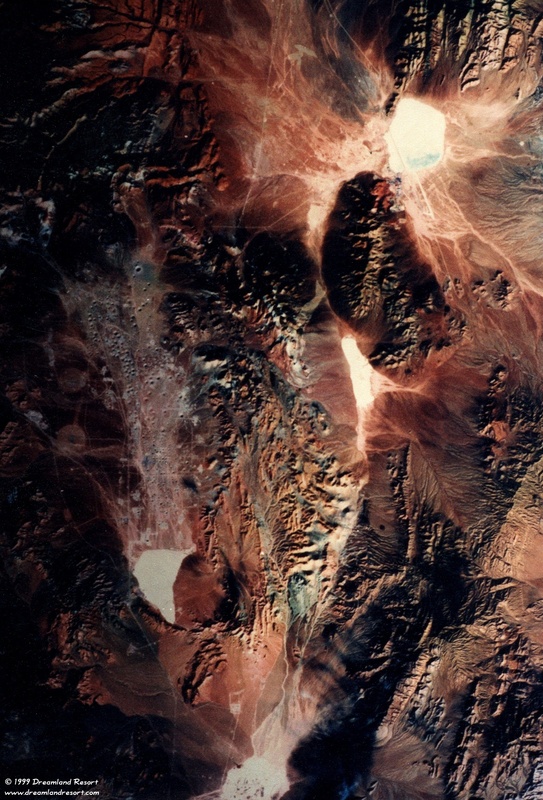 This satellite photo was taken on December 4, 1991 by "Landsat 4". It shows Area 51 and Groom Lake in the north-east, Papoose Lake south of it and the craters from the atomic tests in the 60's at Yucca Flat and Frenchman Flat west of Papoose in the Nevada Test Site. The town of Mercury is in the south, and the mysterious Area 19 in the very northwest corner. You can clearly see the buildings of Area 51 just southwest of Groom Lake, and the first runway across the dry lake. The second runway, visible as a white line south of the lake, is just under construction. Click here for a super high-resolution version (300 dpi, about 1MB). Photo provided by Chuck Clark, with friendly permission.